Photography by Johan Zetterquist, design by minitron. An Ash International sampler released to coincide with the HISS installaton in the elevator in the Lydmar Hotel, Stockholm, Sweden. All the Ash regulars are here… Disinformation [vs. Evan Parker], S.E.T.I., Bernd Friedmann, Runaway Train, Lem Tuggle, Mark Van Hoen & Daren Seymour, AER, Hazard and others. Opening with the solitary sound of a film projector, Ash International’s Hiss compilation has more to do with cinema and storytelling than it does with music in the traditional sense. The montage of processed site recordings and chance recorded conversations maintains a high level of quality throughout. Evan Parker’s saxophone solos over Disinformation’s chattering static upwellings has to be one of the most moving academic pieces I’ve ever heard. Other fantastic pieces include Hazard’s shimmering forest ambience inspired ‘Pylons’, and Leif Elggren’s heartbreaking, minimalist reflection upon his mother’s death. The charming bits of conversation interspersed between many of the ambient tracks covers everything from alien voices, to prison breakouts, to even drag-racing. If you enjoy a thoroughly intriguing blend of found dialogue and abstract atmospherics, then this would be an excellent compilation to pick up. 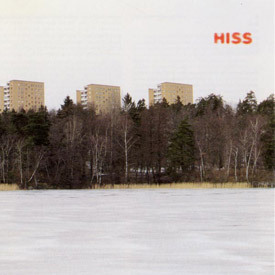 Hiss is about an installation piece, a series of sound works used in an elevator in a Swedish hotel. A redefinition of “elevator music” to give it a more experimental feel, the result is a number of pieces that vary from sound works, spoken word piece and compositions. The nature of the release is that it is a documentation, so each piece is a recording of what each artist presented. With which some pieces are more interesting than others. For me the best pieces presented here are by Leif Elggren, SETI, and Bernd Friedmann. Elggren’s Mother!!? was recorded after the death of “one of his mothers” and is a sustained tone mixed with spoken dialogue, a female voice followed by little blips. While underwhelmed by the most recent SETI album, the selection from that L.M. featured here works in this context, fluctuating and stressed sounds layered together, creates something of a flurry of motion. Bernd Friedmann’s Leisure Zones is an extract of the whole piece. A piece starting with strikes and wet dripping clanks, backed by a rush of harsh air, this shifts and buzzes some, keeping up a movement of sounds. Other tracks which are interesting are AER’s Projector, a short motorised piece, sounding like the progress of a lawnmower past a fixed speaker. Then Hazard’s Pylons, a chromatic drone building with a lush warmth. A piece only listed as Airprox, which is a recording of in-flight announcement looped, acts as a pure source sound – accompanied by the quote “flying is the tobacco of the 21st century”. The Locust/Scala collaboration of Darren Seymour & Mark Van Hoen offer Supermind’s Light Becomes Part Of The Earth, which builds up a melodic piece by combining brushing static washes with bobbing electronic sounds and a clear melodic structure – a light and attractive piece. The last piece is another with just a straight title – I Saw It All Happen From Beginning To End And I Still Can’t Believe What I Saw – a pulse and wheeze of medical equipment, electronic hum and compressive motions as recorded by MCS Harding (ASH) and Jeff Sedgley (Firework) and being an extract from a piece 6 hours long! Of the remaining pieces I find Lem Tuggle’s Breakout particularly tiresome. Being a recording of the man’s attempts to breakout from death row, as such it is a spoken piece, which for documentation purposes may have a momentary interest for some. But for repeat listens of the collection I find no lasting interest, though a lot of that is personal perception of the piece.